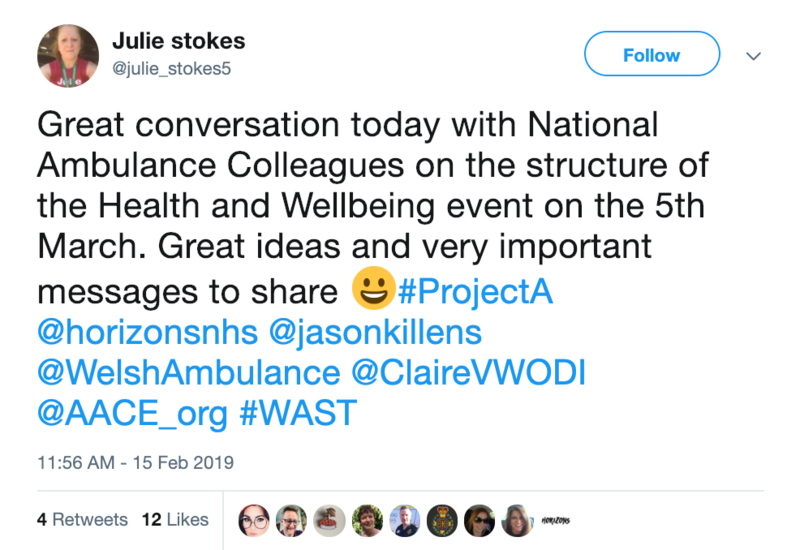 Are you interested in ambulance staff wellbeing? Join us at our event on 5 March in London, where we'll be coproducing solutions. 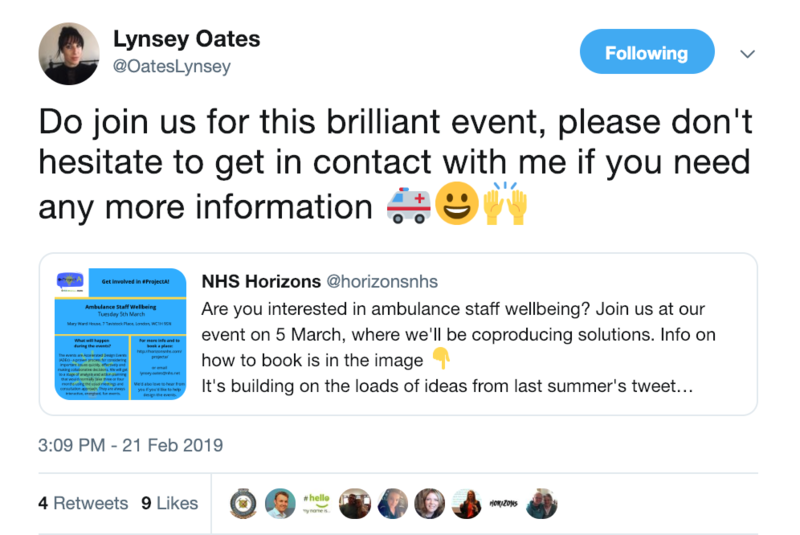 Get in touch with Lynsey if you need more information, or would like to attend. 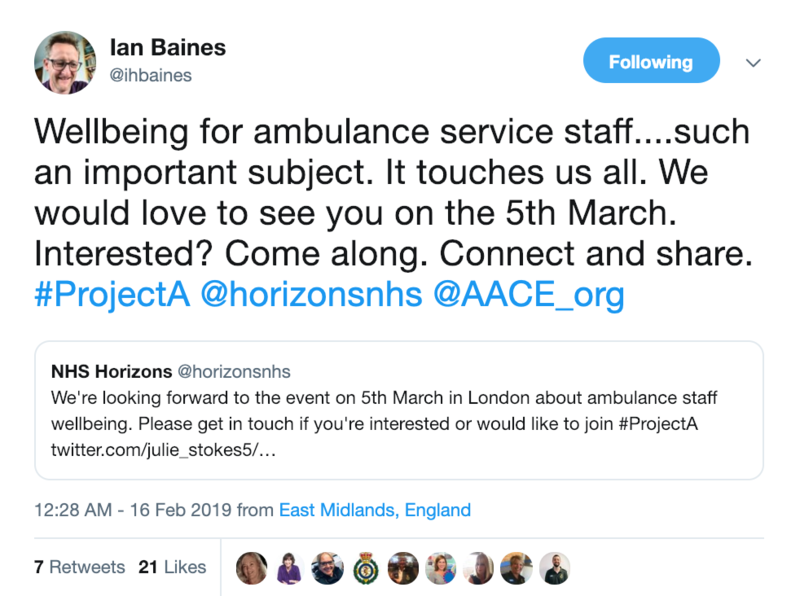 Ambulance colleagues have been involved in designing the event. 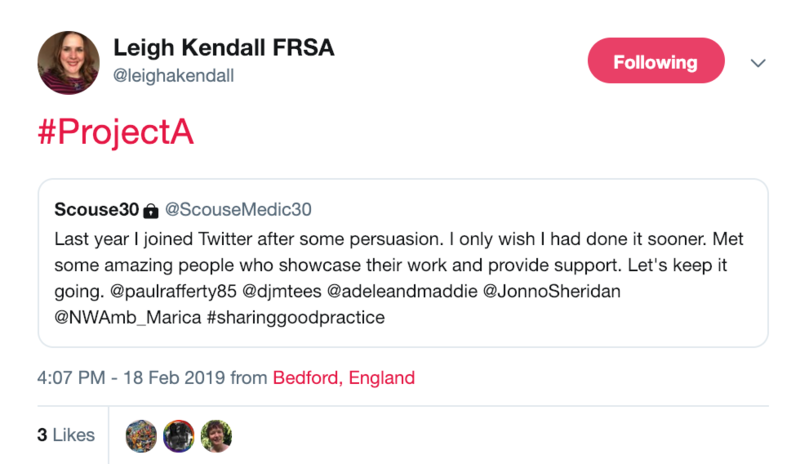 This ambulance colleague is sharing how much they have benefited from joining Twitter, which is great to see! 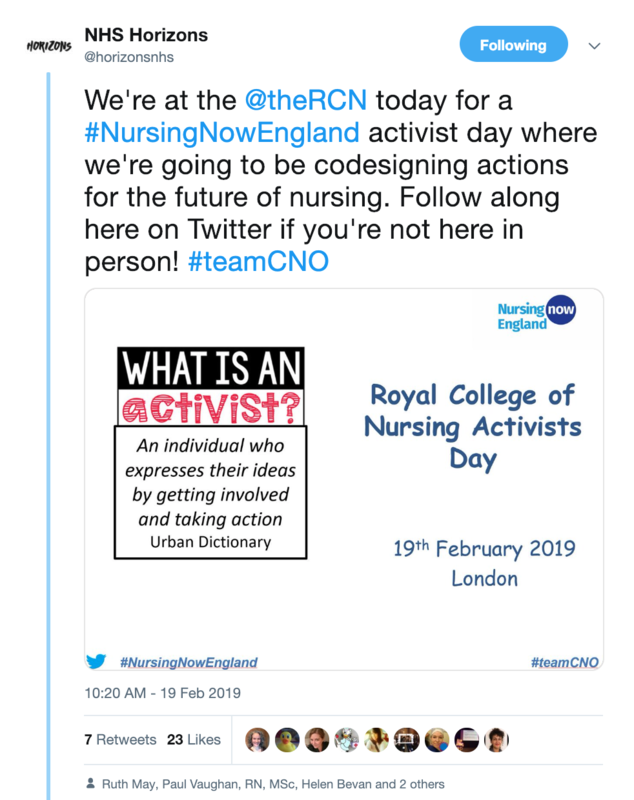 Thank you to everyone who attended the Nursing Activists' Day at the Royal College of Nursing on 19th February. Helen facilitated the day - this brilliant graphic summaries the output. We had so many great, in depth conversations. We talked about the issues we need to tackle, and we made action plans. 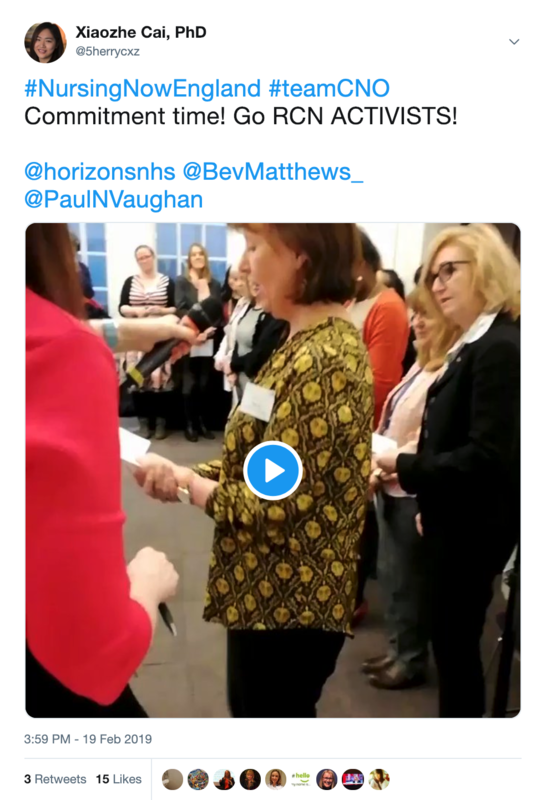 A key message from this event was about being loud and proud about being a nurse. 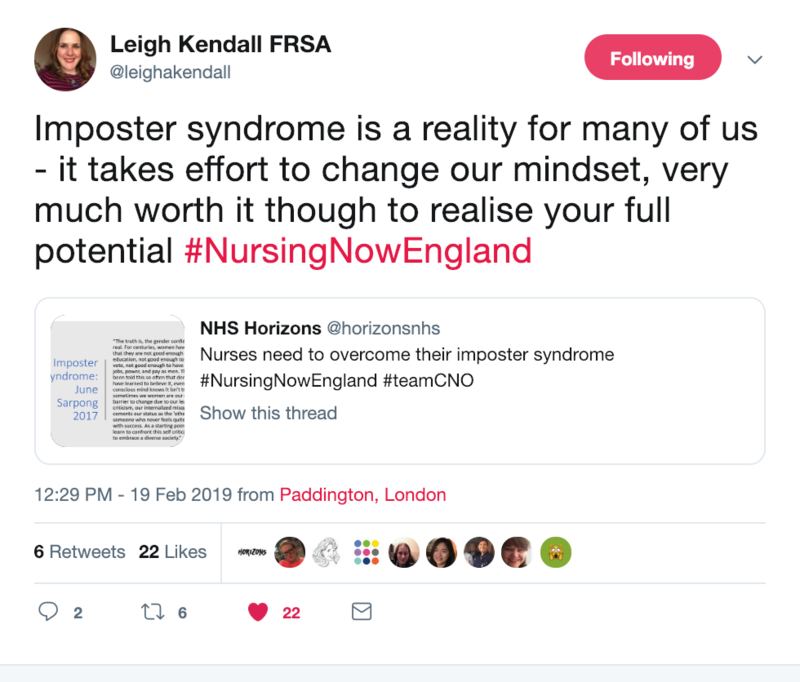 Let's challenge imposter syndrome, support one another to change our mindsets and realise our full potential. 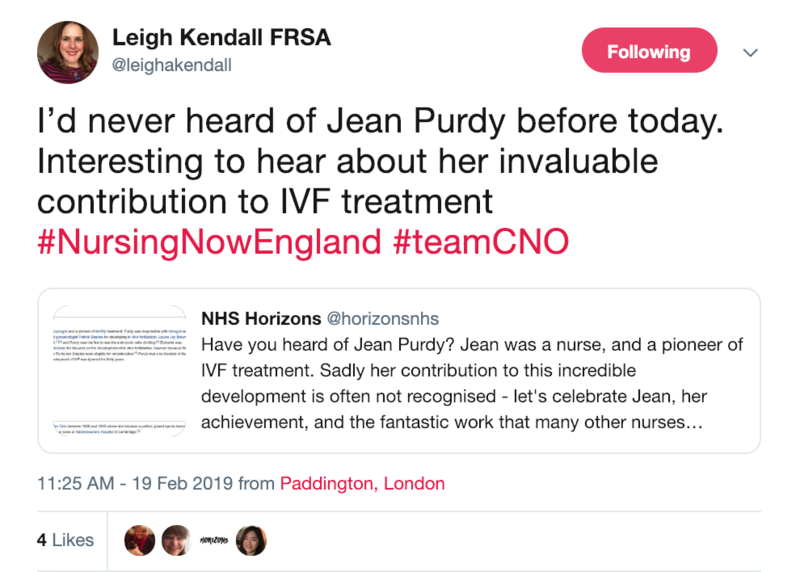 Have you heard of Jean Purdy? Jean was a nurse, and a pioneer of IVF treatment. 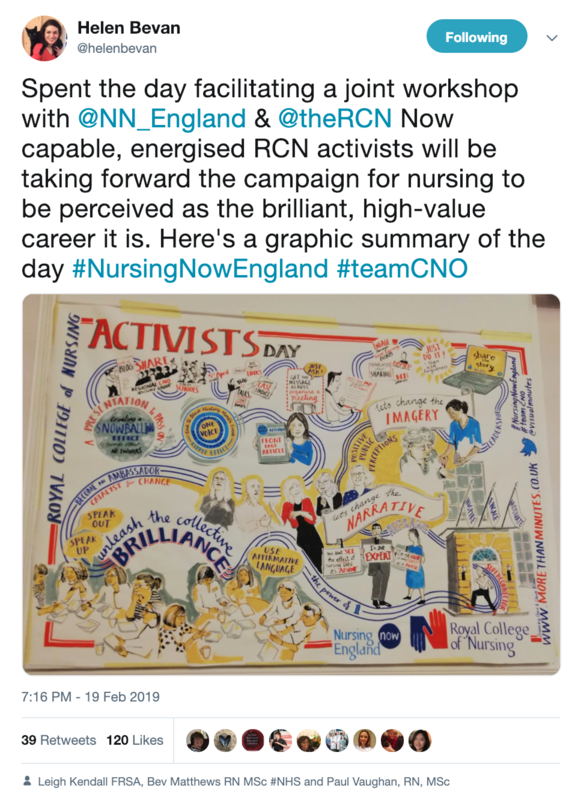 Sadly her contribution to this incredible development is often not recognised - let's celebrate Jean, her achievement, and the fantastic work that many other nurses do too. 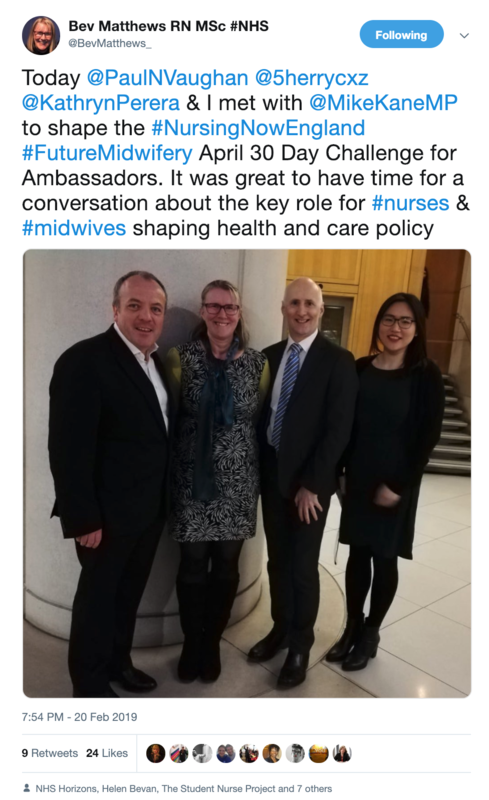 We need to go out there, do more shouting about the incredible achievements of nurses! 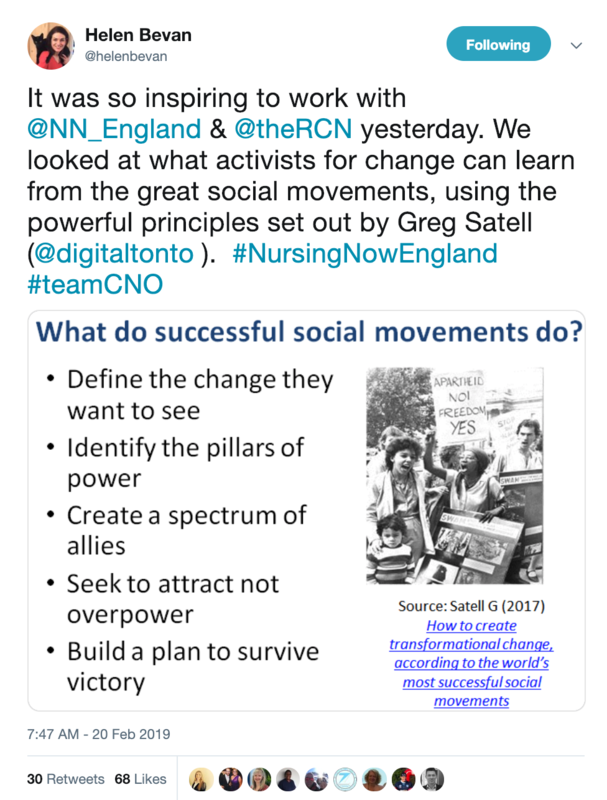 We looked at what activists for change can learn from the great social movements. 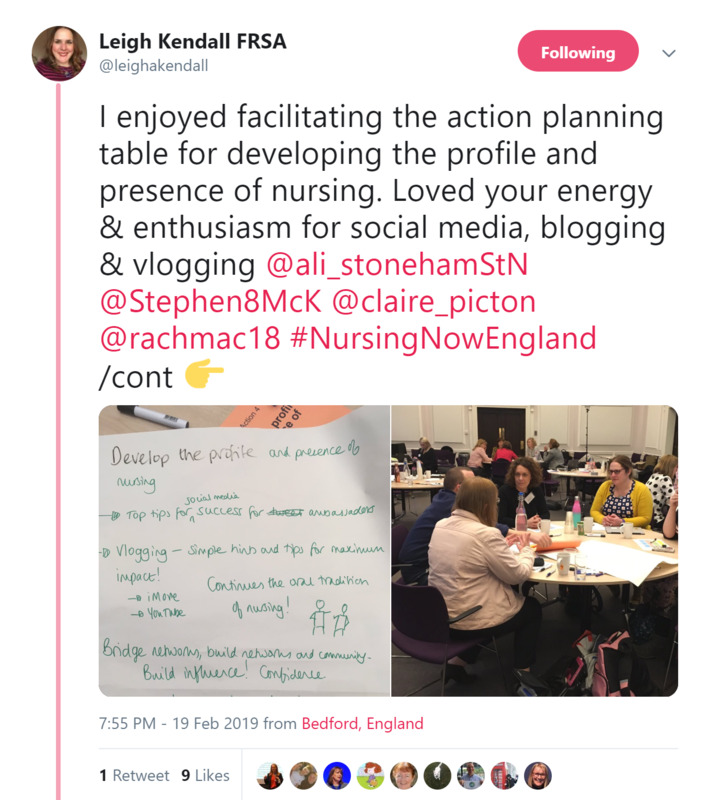 Leigh enjoyed facilitating the action planning table for developing the profile and presence of nursing at the event - there was brilliant energy and enthusiasm for social media, blogging, and vlogging. 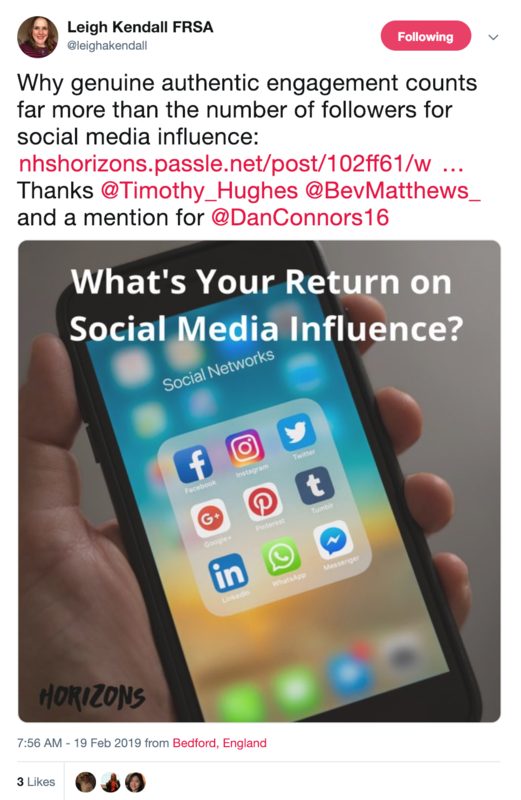 Leigh shared some useful links about social media - click to see the thread. It’s our way in Horizons to always end our fast paced Accelerated Design Events with something positive and inspiring. Today we all crossed the commitment line after we shared a key activity that we were each going to commit to doing. Great fun! 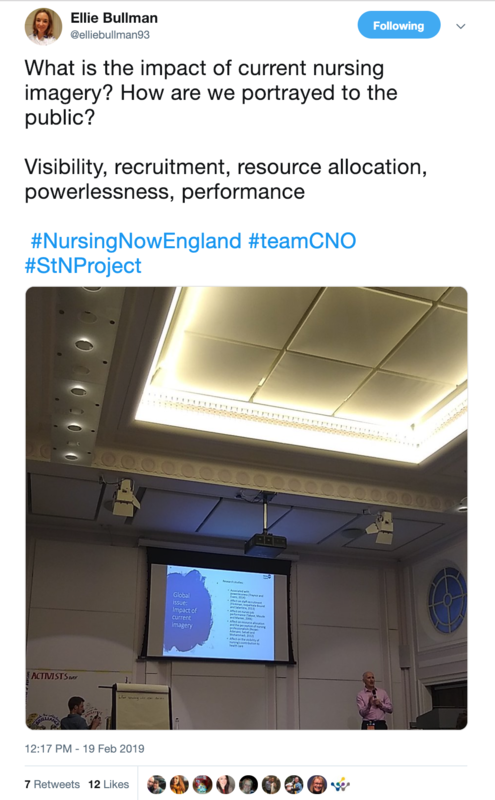 All you need is a reel of duck tape to make the line and a fantastic room of original and new #NursingNowEngland Ambassadors. 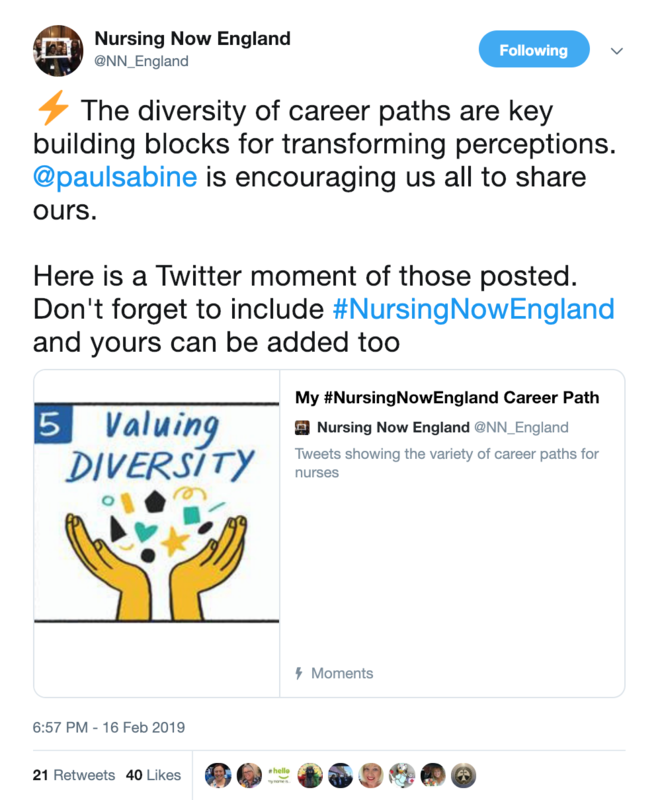 Nurses have many varied career paths: they've been compiled in this Moment. 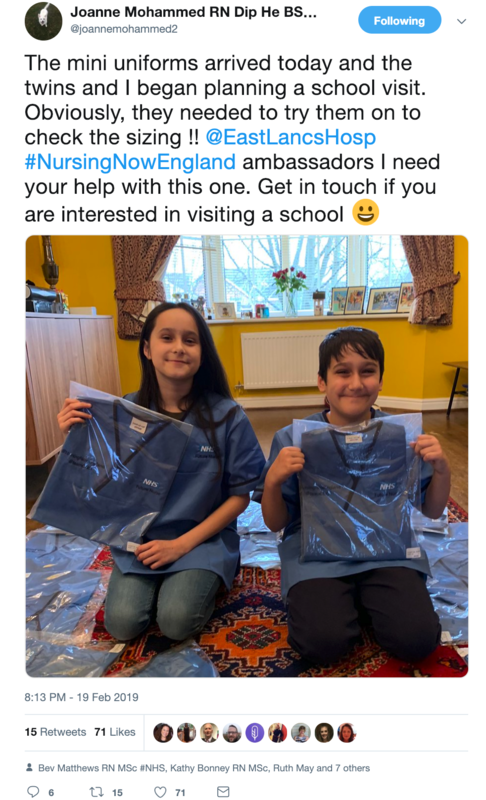 The enthusiasm for the mini uniforms for children as part of encouraging them to choose a career in nursing continues! Bev, Sherry, and Kathryn went to meet Mike Kane MP to prepare for the April 30 Day Challenge. 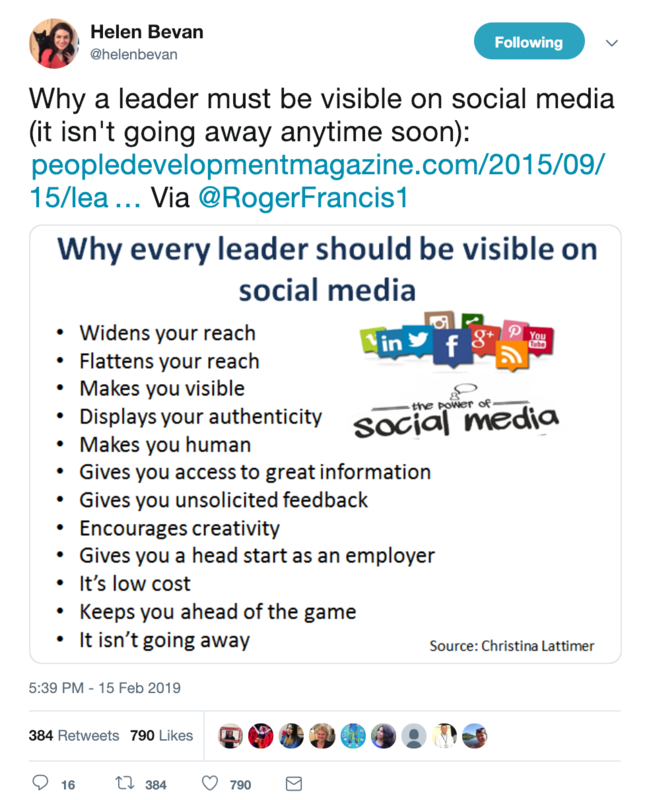 He shared a lot of insight and great advice on better communication with MPs. 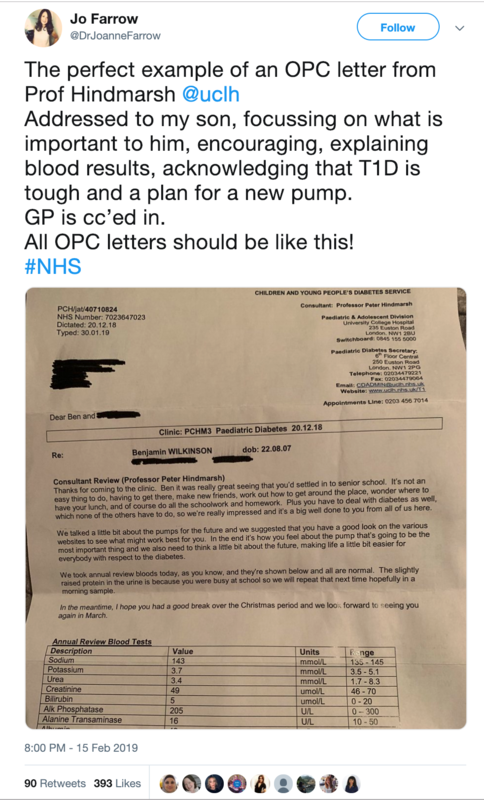 Thank you Mike! 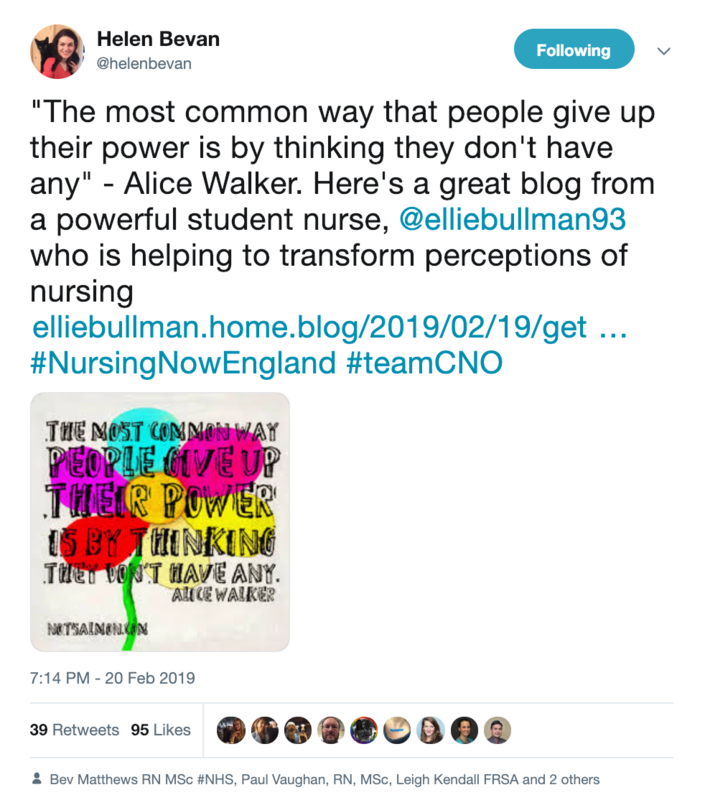 "The most common way that people give up their power is by thinking they don't have any" - Alice Walker. 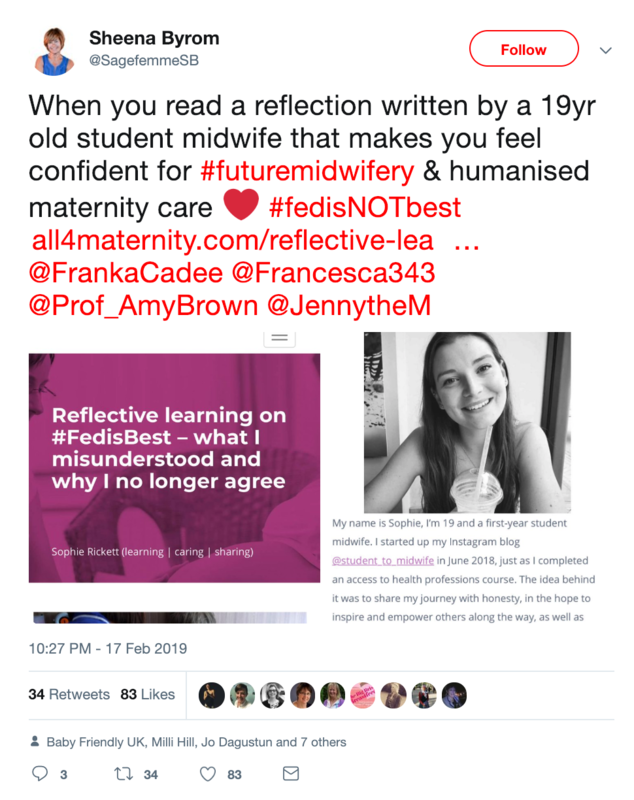 Here's a great blog from a powerful student nurse, who wrote about Getting Involved as a Student Nurse in the Nursing Now England campaign. 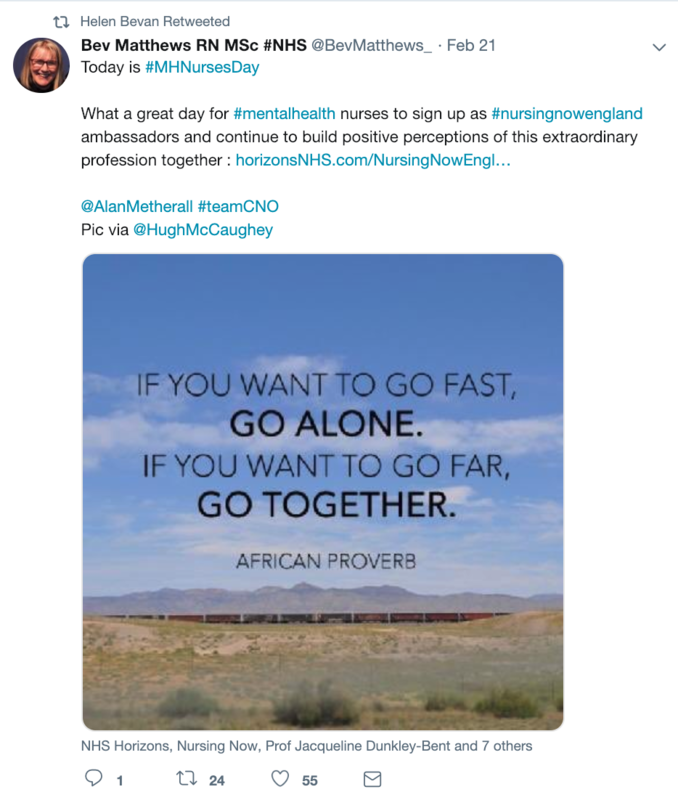 The first ever Mental Health Nurse Day was on 21st February. 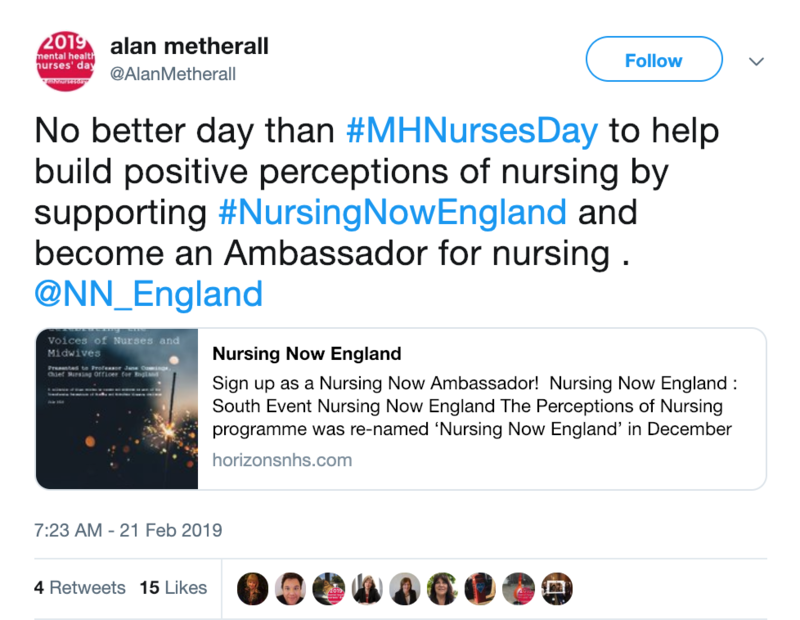 Mental health nurses got together on Twitter to encourage more interest in the specialty, as well as sign up to become Nursing Now England ambassadors! 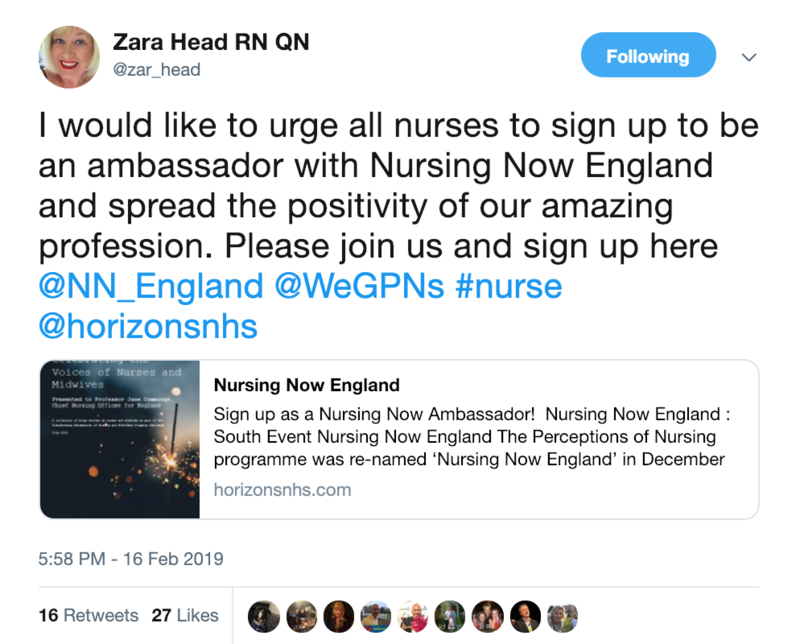 Sign up to be a Nursing Now England ambassador today! 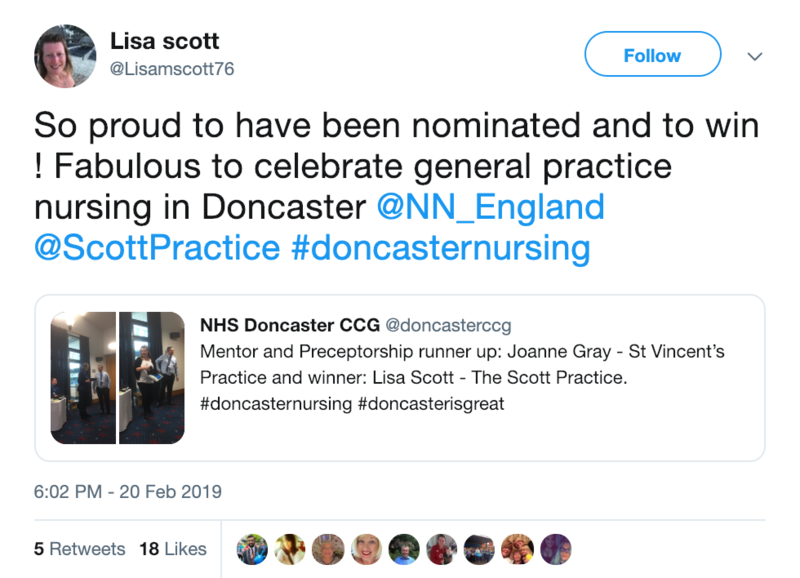 Well done to Ambassador Lisa! 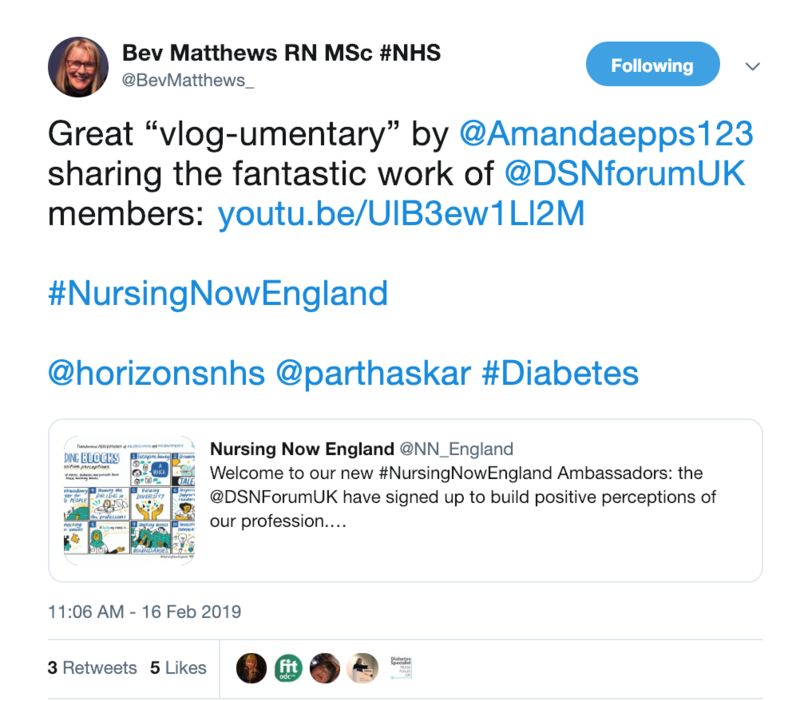 It's great to see our ambassador community is developing - watch this space for a Nottinghamshire network of Nursing Now England ambassadors! 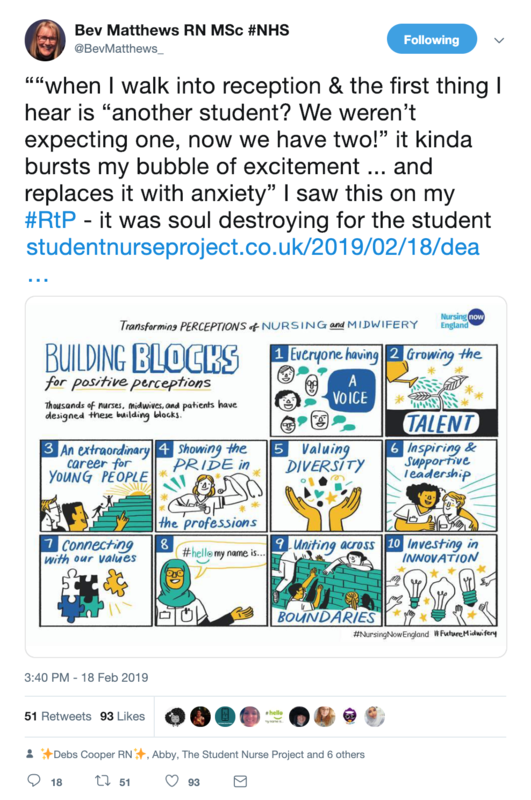 A beautiful and honest blog by Andrea Sutcliffe, who is the new Chief Executive of the Nursing and Midwifery Council. 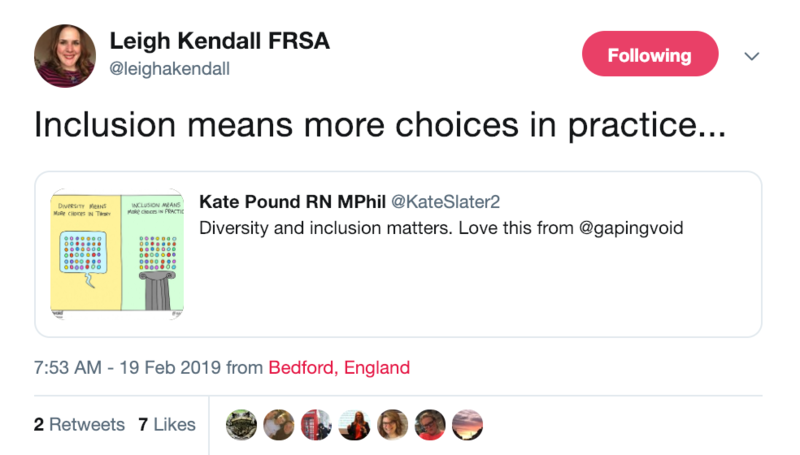 The secret of improving patients' experience is in making sure communications and interactions are patient-centred, such as in this wonderful example. 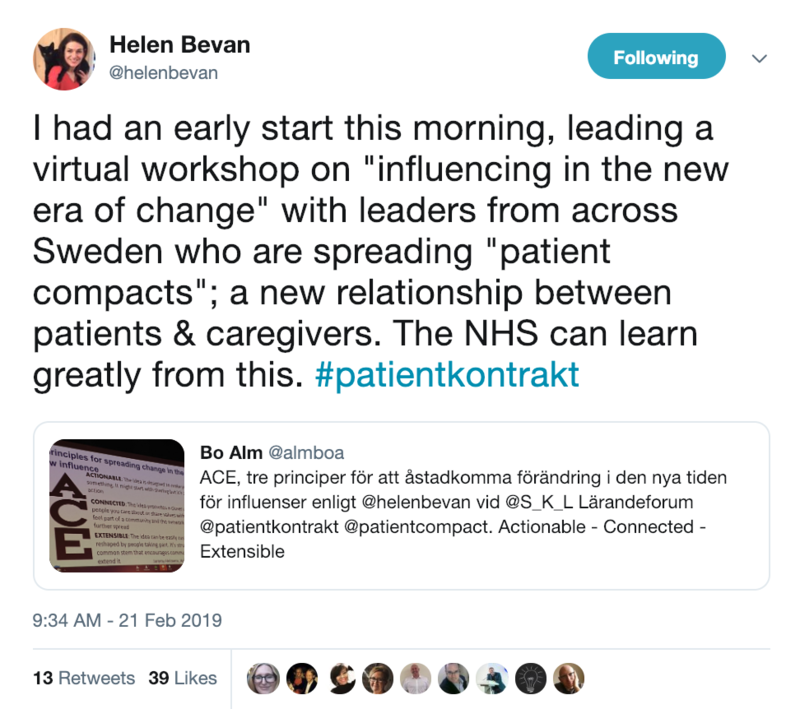 Helen led a virtual workshop on "influencing in the new era of change" with leaders from across Sweden who are spreading "patient compacts"; a new relationship between patients and caregivers. 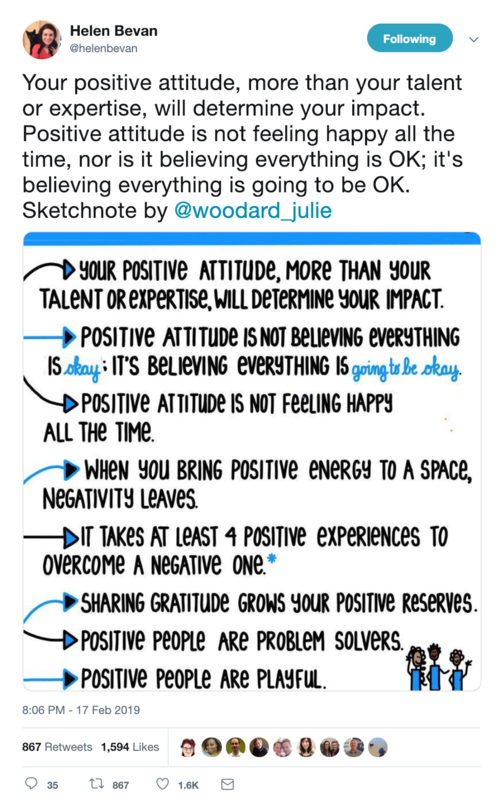 Your positive attitude, more than your talent or expertise, will determine your impact. 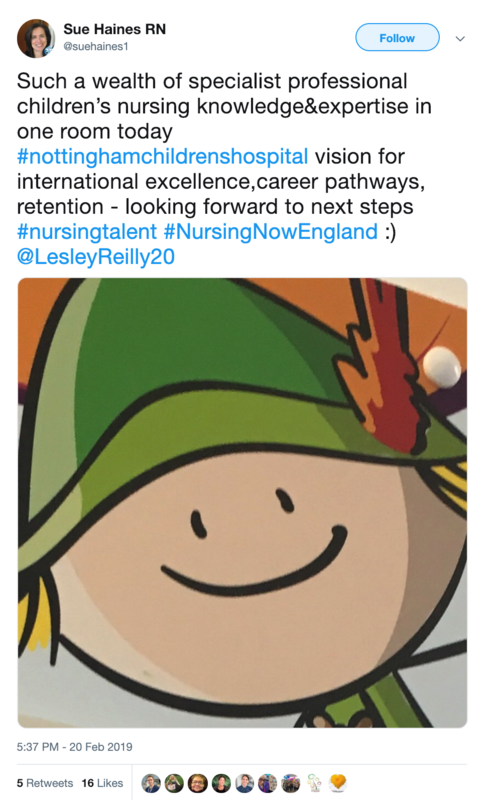 A reflection from a Children's Nurse: what my role in tackling the challenge of health inequalities. 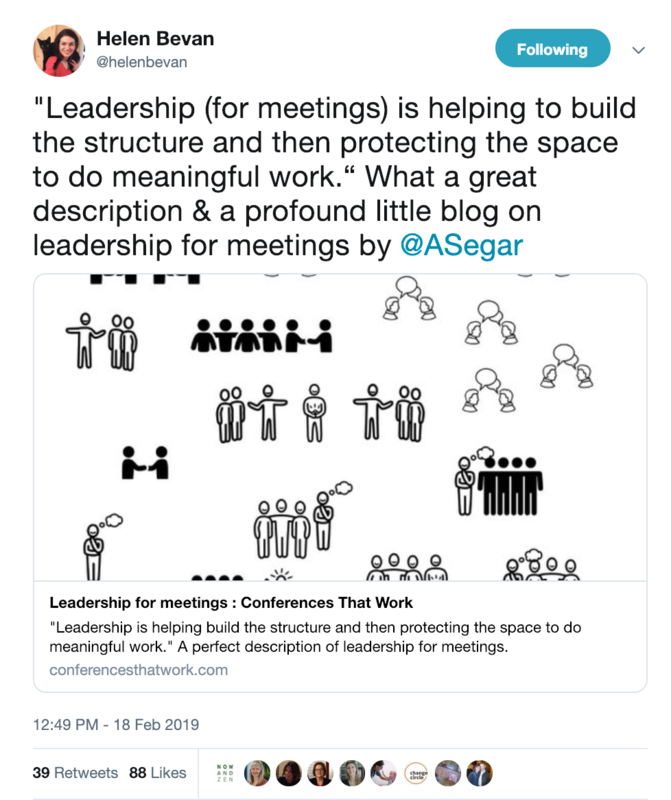 Have you ever held a walking meeting? 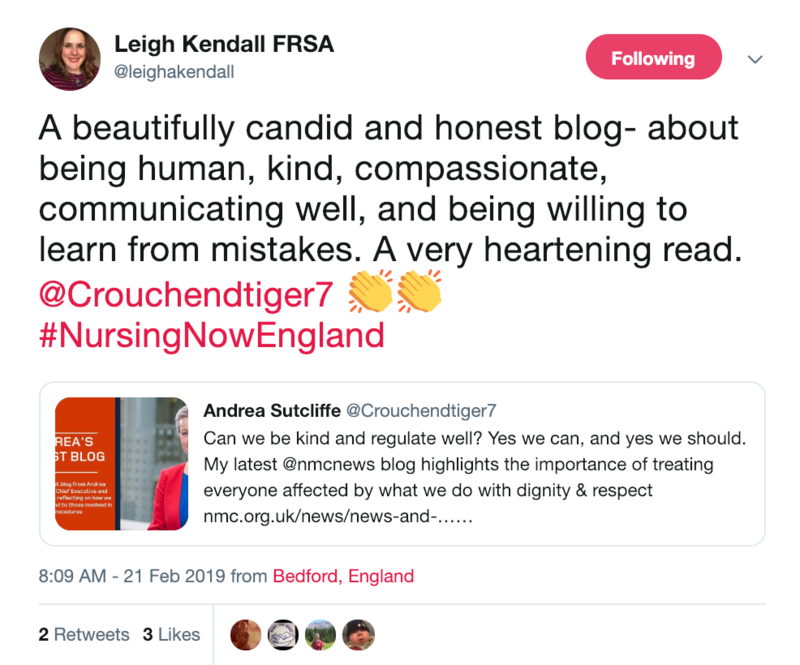 Zoe and Leigh did recently - productive as well as good for their wellbeing! We scare ourselves thinking about how much we think others know, and that we know nothing. 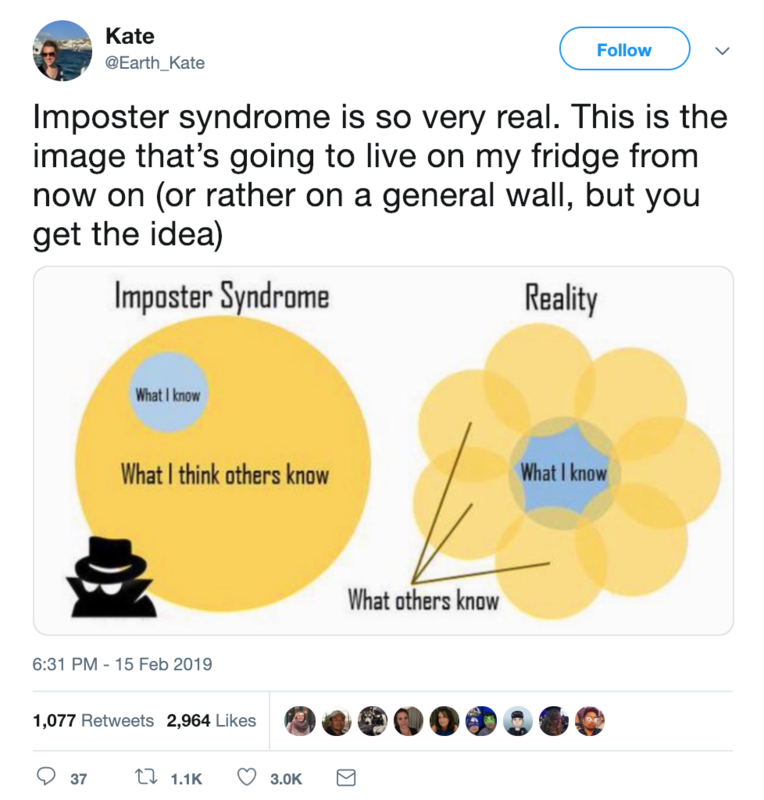 Here's a reminder: don't get beaten by imposter syndrome! 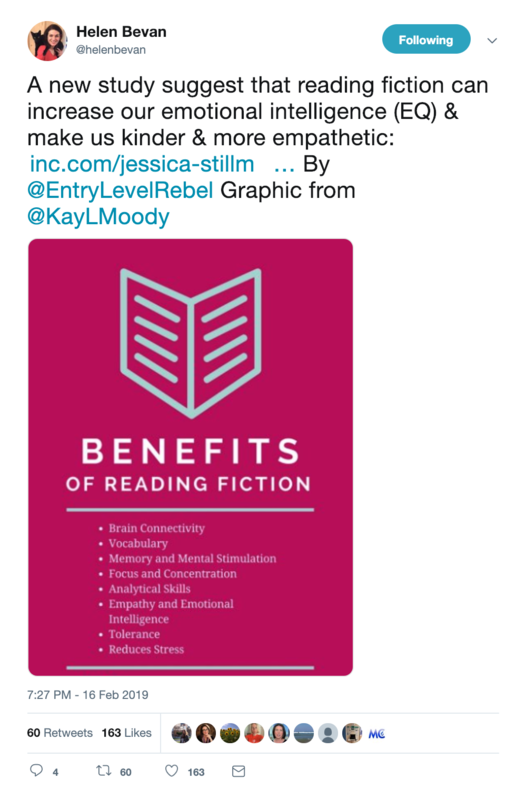 A new study suggest that reading fiction can increase our emotional intelligence (EQ) & make us kinder & more empathetic. 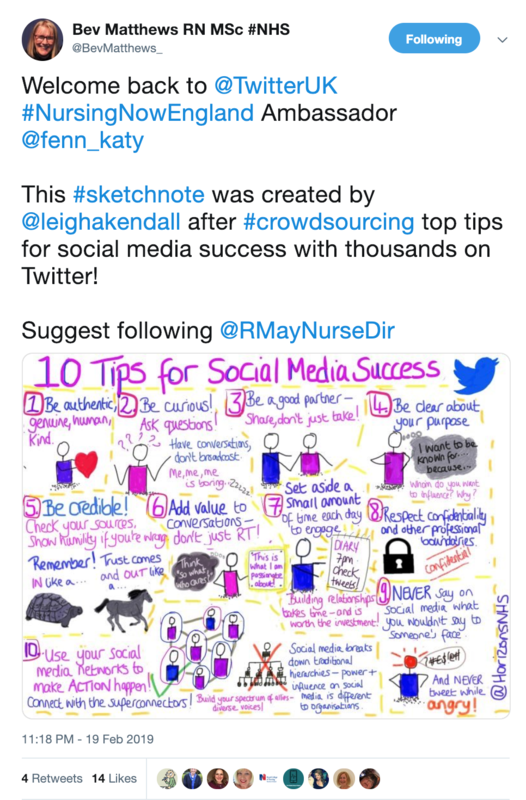 Why genuine authentic engagement counts far more than the number of followers for social media influence...Read Leigh's blog to find out more. 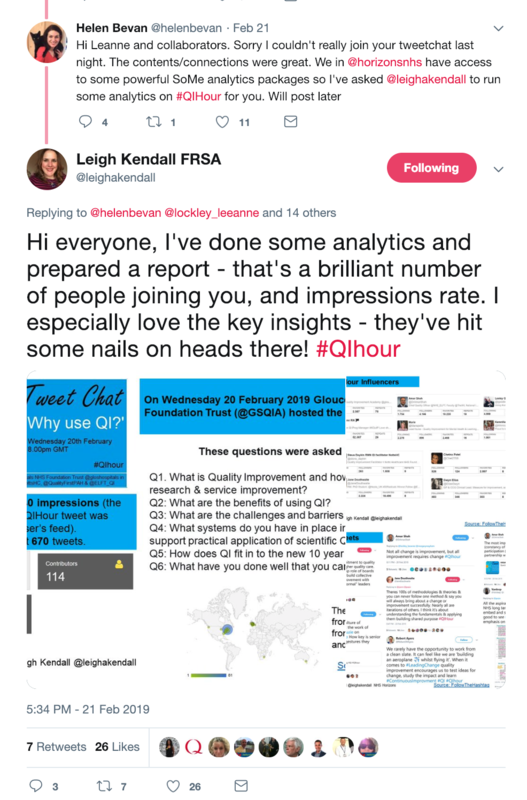 Tweet chats are a great way to meet and interact with like-minded people. 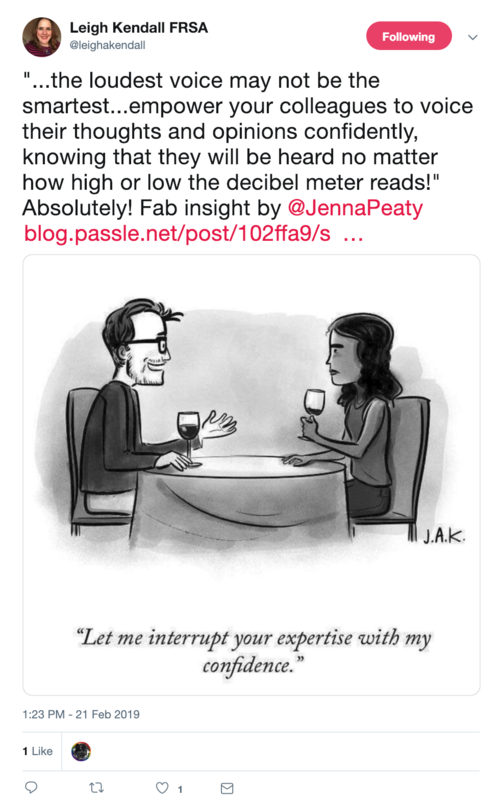 It allows great discussions over the topic that people are interested in and passionate about, it can help answer our questions, and it could also be a powerful bridge for communities. 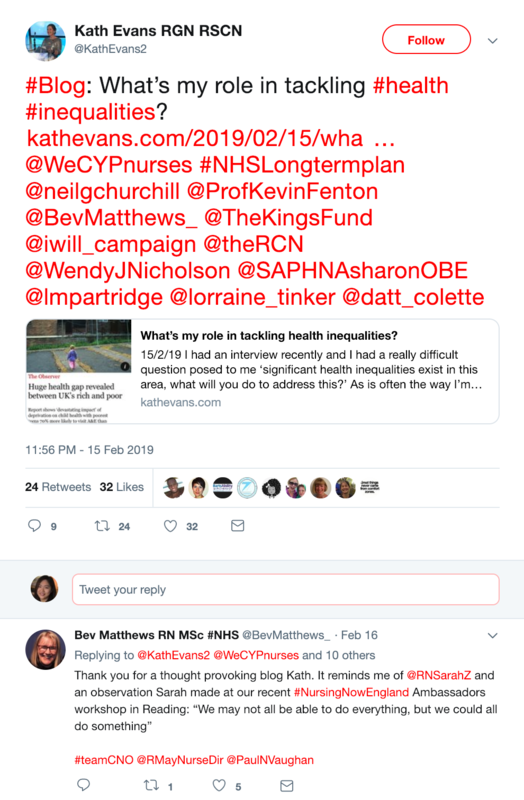 After a tweet chat, it's always good to have a review of the data. 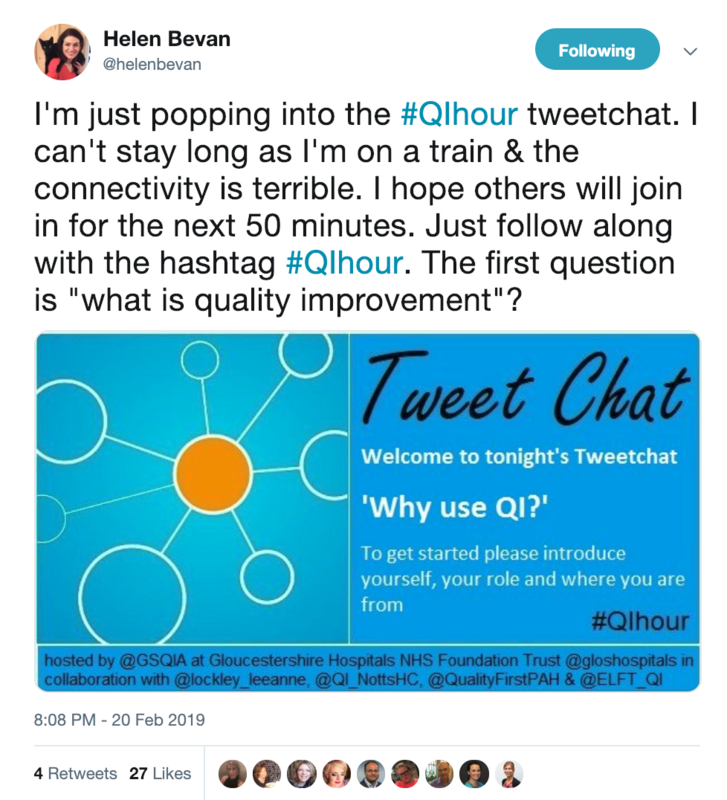 Leigh has done a great example for #QIhour. 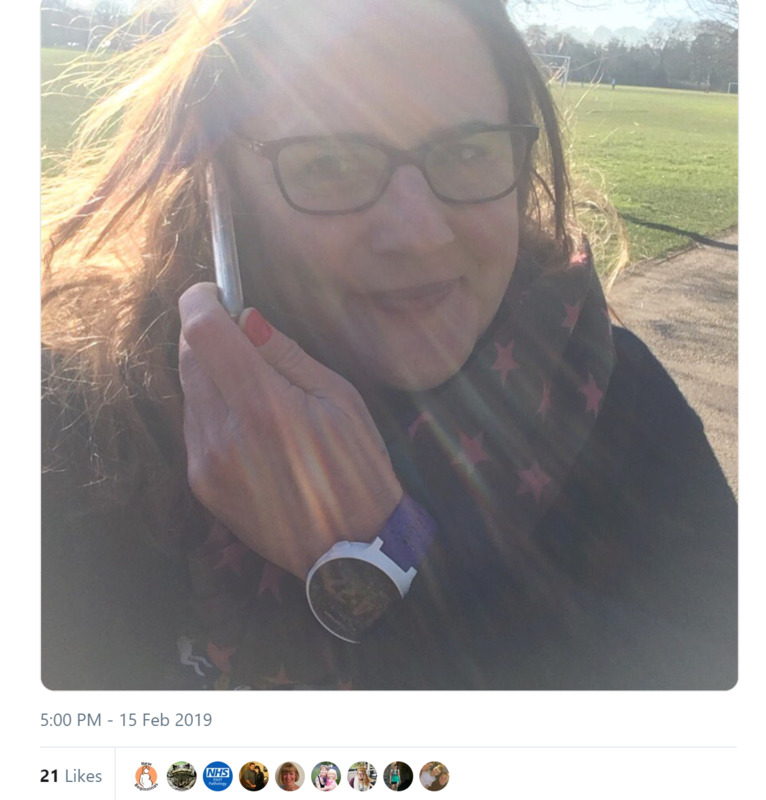 Many of us are addicted to our smartphones... 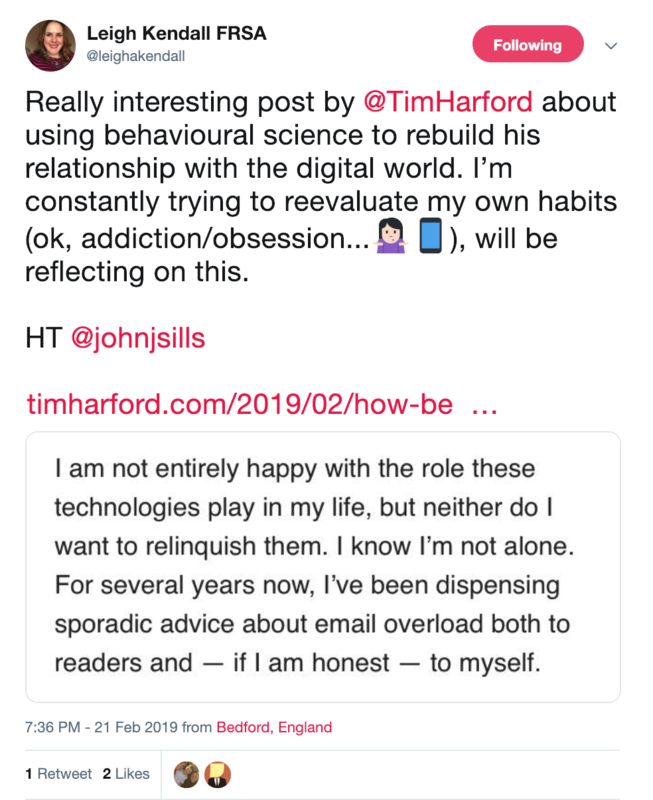 Hear from Tim on : How behavioural economics helped me kick my smartphone addiction. 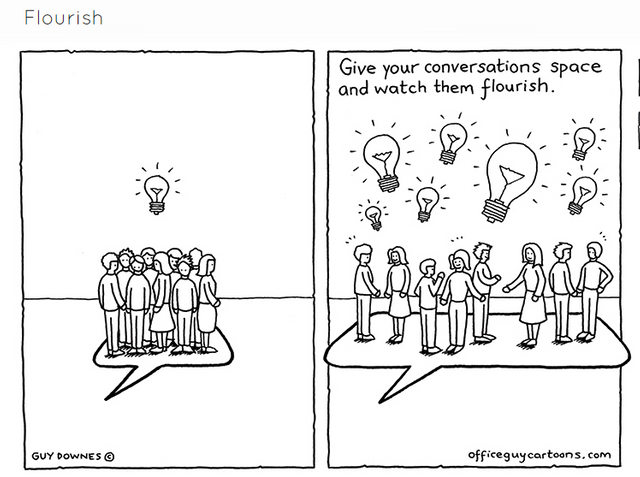 Give your conversations space and watch them flourish. 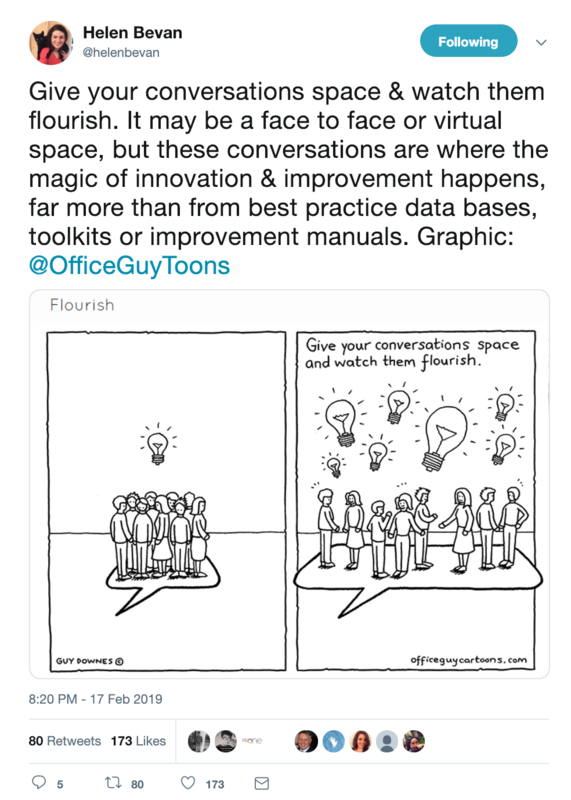 It may be a face to face or virtual space, but these conversations are where the magic of innovation and improvement happens, far more than from best practice data bases, toolkits or improvement manuals. 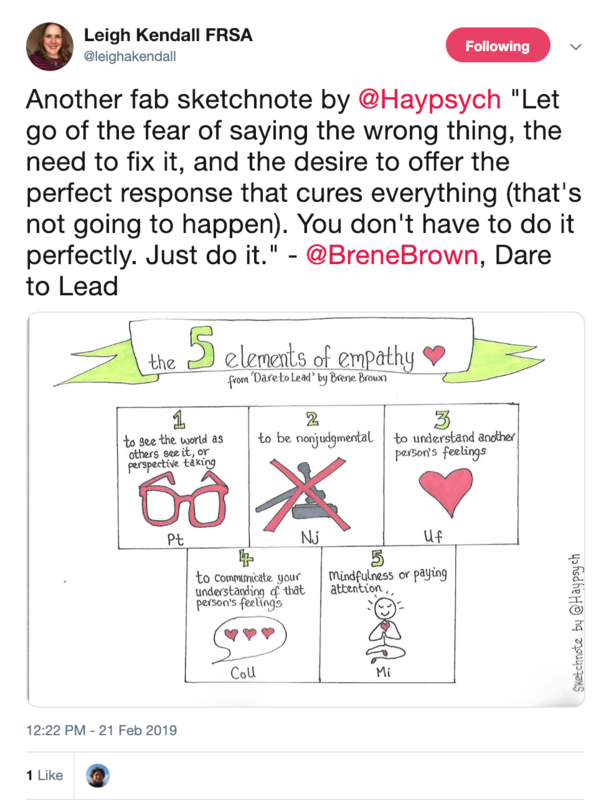 "Let go of the fear of saying the wrong thing, the need to fix it, and the desire to offer the perfect response that cures everything (that's not going to happen). You don't have to do it perfectly. Just do it." - @BreneBrown, Dare to Lead. Sometimes the smallest voice packs the biggest punch. 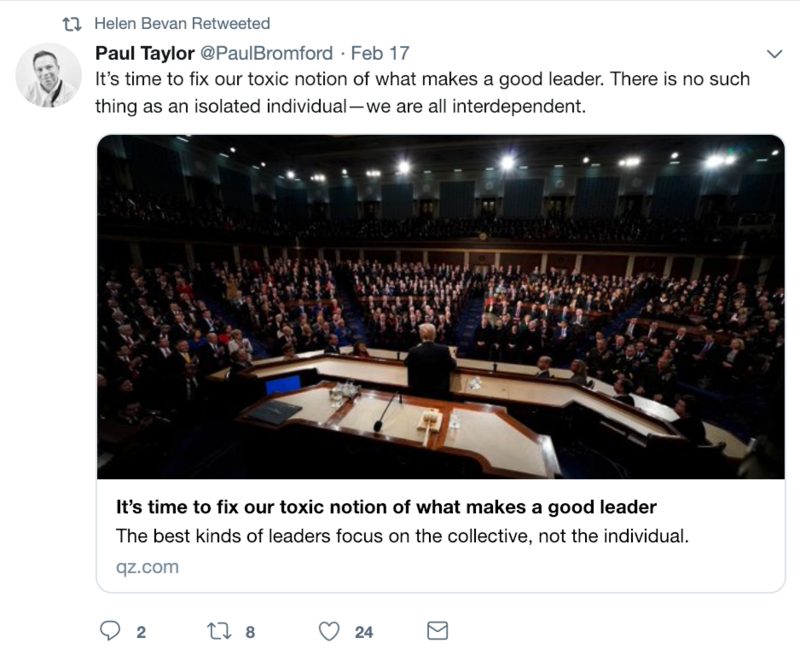 It’s time to fix our toxic notion of what makes a good leader. There is no such thing as an isolated individual—we are all interdependent. 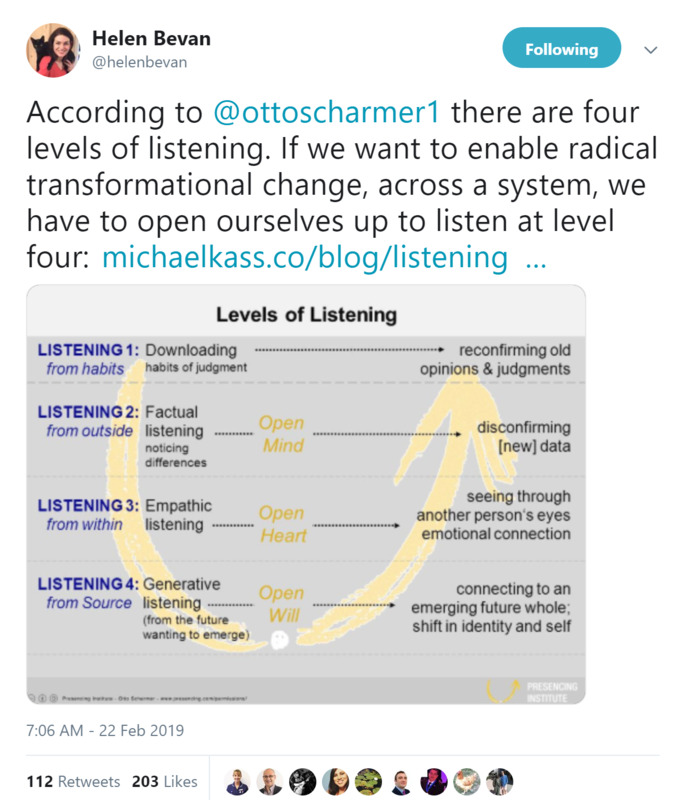 What is the source of "five energies for change"? 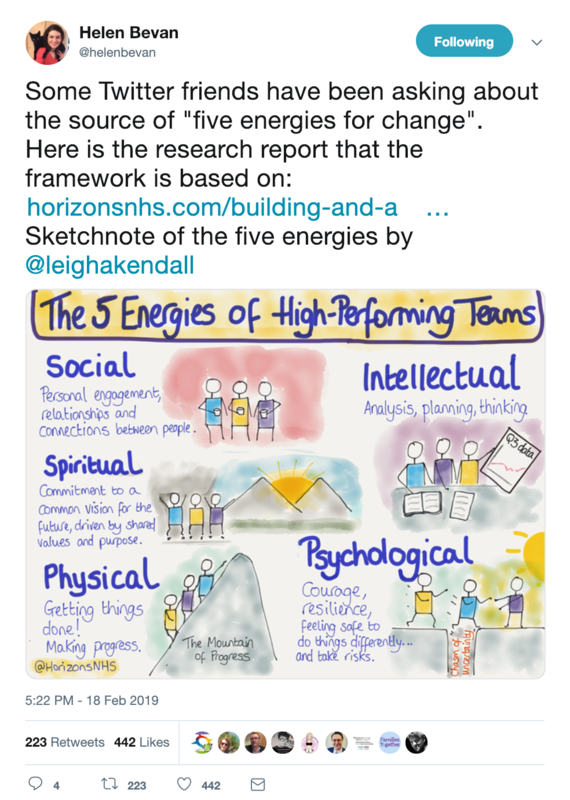 Here is the research report that the framework is based on: Building and Aligning energy for change - A review of published and grey literature, initial concept testing and development. 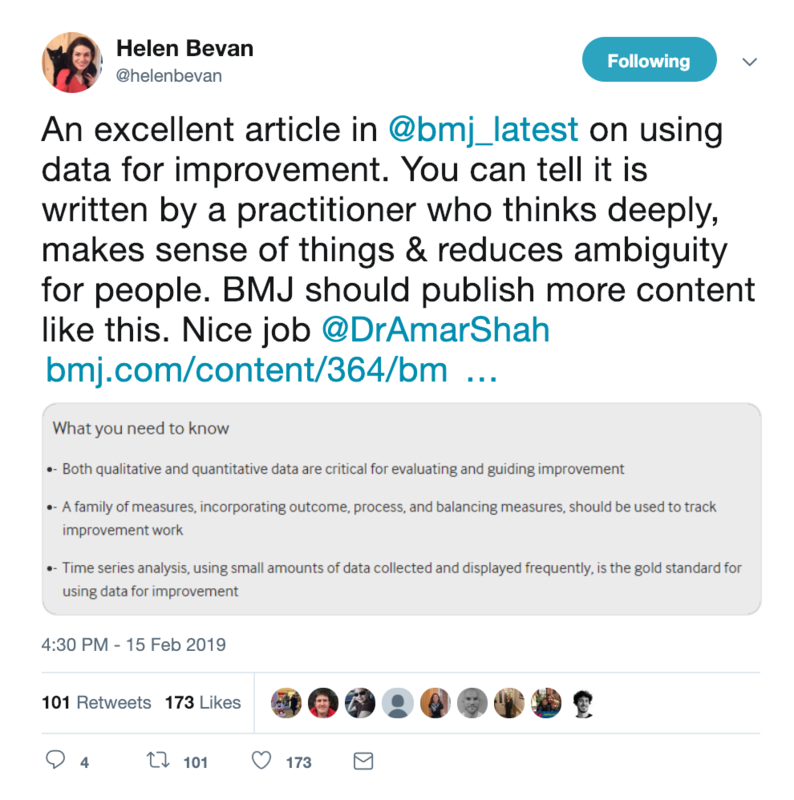 An excellent article on using data for improvement. 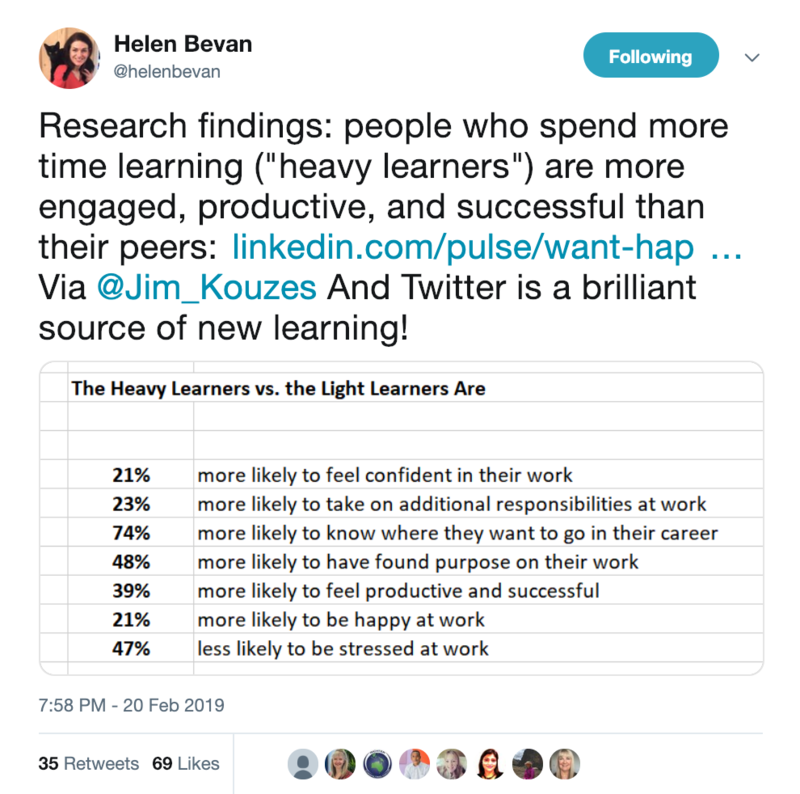 Research findings: people who spend more time learning ("heavy learners") are more engaged, productive, and successful than their peers. 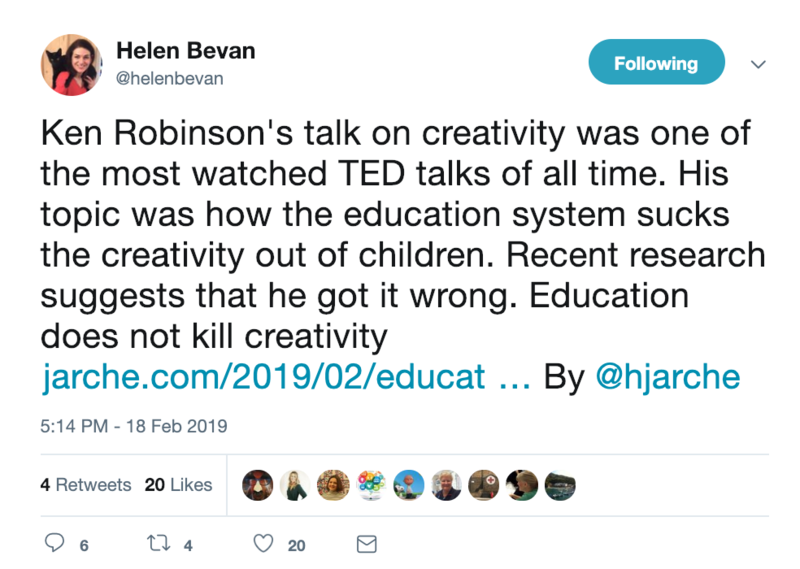 We've been told schools kill creativity. Latest research proves it wrong: education does not destroy creativity!